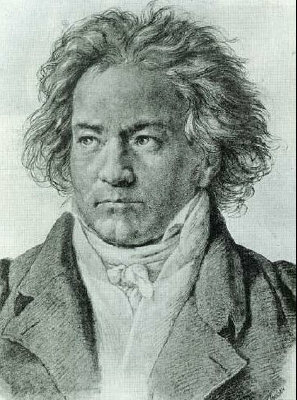 After an unhappy childhood in Bonn, where his drunken father would return late with rowdy friends and drag young Ludwig out of bed to entertain them at the piano, Beethoven moved to Vienna in 1792. He immediately established a reputation as a composer and pianist and enjoyed the patronage of the rich aristocracy. One of these patrons was Prince Franz Joseph Maximilian von Lobkowitz. He was a keen musician who played the violin and who had a private orchestra which he made available to Beethoven. The triple concerto was dedicated to him as were the third fifth and sixth symphonies. Little is known for certain about the origins of the triple concerto. It is believed to have been written in 1803, and it was one of several works sent by Beethoven to his publisher in 1804. It did not receive a public performance until four years later, though it may well have been performed earlier in private in Prince Maximilian’s palace. It has been suggested that the piano part was written for Beethoven's young and influential piano student, the Archduke Rudolf, brother of the Austrian emperor. However, the piano part is a difficult one, and favours the alternative view that Beethoven wrote it for himself to play. The work belongs to Beethoven’s middle period and is typical of it. The forces are formidable and the scale is grand. It is a unique work in music being the only successful concerto for its particular grouping of instruments. Beethoven rises to the challenge of combining the three solo instruments with the orchestra with considerable ingenuity. The piano writing differs from his sonatas and chamber works in that it contains very little chordal music. Considerable use is made of contrapuntal writing with passages of single and double broken octaves, elegantly varied with arpeggios and trills. Thus the piano never dominates in the grouping but acts as an equal partner. The first movement is in sonata form with the exposition first presented by the orchestra and then elaborated by the soloists. The development is largely entrusted to the string soloists with decorative material from the piano. The recapitulation is shared between the orchestra and soloists and continues to develop the musical argument. The slow movement (Largo) is in the distant key of Ab major After a short introduction the thematic material is presented by the cello in a very high register accompanied by muted strings The piano joins in later with delicate and discreet unison arpeggio figuration. The movement itself is short and has sustained lyrical beauty that forms a strong contrast to the grandeur of the first movement and the lively brilliance of the last. The final movement is a rondo based on a sparkling Polish theme. It begins on the cello, playing very high with a shimmering string accompaniment. The other soloists join in tossing fragments of the melody to each other before it erupts on the whole orchestra. There are two contrasting episodes both maintaining the drive and energy of the movement. The final return of the rondo theme is greatly extended by brilliant virtuoso passages for the three soloists. Despite its obvious quality the triple concerto has never enjoyed the success of Beethoven’s other concertos. Early critics were unfavourable, calling it a Piano Trio with orchestra. Never the less it has remained in the repertoire and never ceases to delight audiences. Beethoven's triple concerto was performed by the Portobello orchestra on the 10th December 2005. The soloists were Coriander Stuttard (violin), Susie Winkworth (cello) and Catherine de Sybel (piano) and the conductor was Anthony Weeden.